Cornish National Tartan Ribbon is a relatively recent product, but its heritage can be found in the thousands of years of the Celtic history of Cornwall. Sitting at the far South Western tip of the British Isles, Cornwall has traditionally never really considered itself properly "English", the people and culture preferring to identify with the fellow Celtic nations of Ireland, Wales and Scotland. Cornwall also shares Celtic links with the Bretons and with other parts of Northern Europe, developed over thousands of years of shared important trade routes, especially in lead and tin. In the ancient Tumuli (burial grounds) found throughout Cornwall, fragments of checked/tartan cloth have frequently been unearthed. The Romans described the dress of the Western tribes of Britain as being a "loose tunic of chequered material ... drawn in at the waist by a leather belt". The Roman name given to the Celts that lived in the far South West was "Cornovi"... a name now shared by the company Cornovi, who are undoubtedly the Cornish tartan specialists. 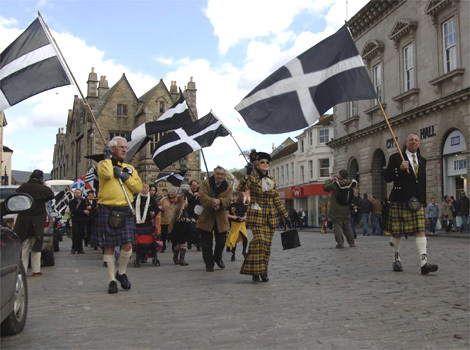 We in Scotland regard ourselves as Celtic "cousins" of the Cornish, and are delighted to witness the revival in Cornish Celtic culture, the sense of national identity and the growing popularity for wearing Cornish tartan. 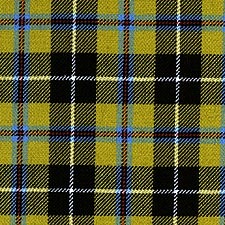 Of the three Cornish tartans produced, the Cornish National Tartan remains the most popular and most instantly recognisable. tartan-ribbon.com are proud to have worked with Cornovi to produce the Cornish National Tartan Ribbon. Cornovi have over 25 years experience in kilt hire and offer an unrivalled range of Cornish tartan products and accessories. If you're interested in Cornish tartan, you really must visit the excellent Cornovi website. The Cornish National Tartan Ribbon is a modern tartan, thoughtfully researched and designed... each colour in the Cornish National Tartan has a special meaning: the single white overcheck on black creating the cross of St. Piran's banner, the flag of Cornwall. Legend says the colours came about when St Piran (the patron saint of tinners) watched molten tin spill from the black ore in his fire. The black and gold (gold - not yellow!) are the colours of the ancient Cornish kings; the red is for the beak and legs of the Chough (the Cornish national bird) and the light blue is for the sea, which surrounds Cornwall on three sides. The Cornish National Tartan is available to buy in 10mm (3/8"), 16mm (5/8"), 25mm (1") and 38mm (1½") widths on 25 metre (approx 27½ yard) reels. The Cornish National Tartan sold by tartan-ribbon.com is top quality, authentic tartan ribbon as certified by the Scottish Tartans Authority. For an excellent alternative to the Cornish Hunting Tartan Ribbon, please click here.